To add an SMS cell number for texting messages please follow the steps below. This MUST be done for the number to be activated for use through SwimOffice and OnDeck. Ideally an account holder will perform the below steps, as it requires opening a verification code on their cell phone. If the user does not have OnDeck installed, they can add and verify their number in SwimOffice (see below link), or you can enter their number for them in OnDeck. In OnDeck, tap Menu > Membership > Accounts/Members. Tap the name of the desired user. Tap Edit at the bottom of the screen. Fill in SMS 1 or SMS 2 with the cell number and select their cell Carrier. 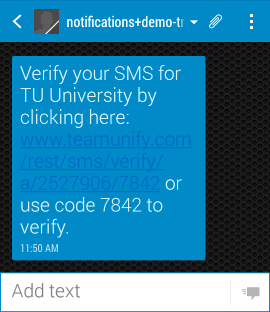 Once they open the message it will usually verify their number, but have them tap the link just to make sure. You will need to go back to the Accounts/Members screen and pull down the list to refresh it in order to see that their number is verified.